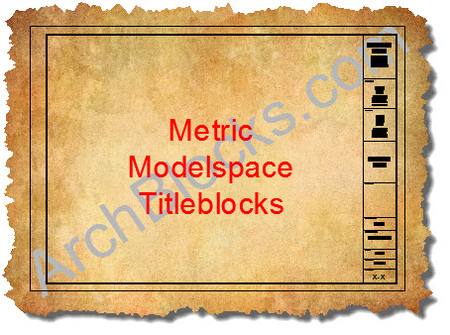 Download these Modelspace CAD Metric titleblocks NOW!! 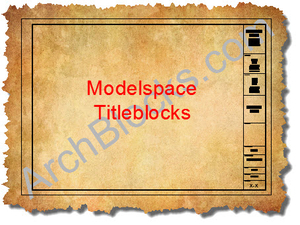 This metric set of CAD Modelspace titleblocks come with 23 seperate .dwg files that include 6 different sheet sizes, the CAD sheet sizes are listed below. The plotted scale factors include 1:5, 1:10, 1:20, 1:50, 1:100, 1:200, 1:250 and 1:500. AutoCAD TIP: Use these Titleblocks to create your own project startup file, also called a "Drawing Template" file in AutoCAD. These template files have a file extension of (.dwt). 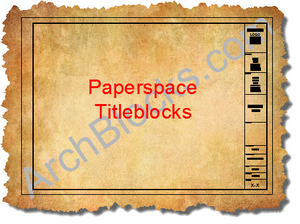 This will save you a save time in setting up your template file because you will have the border and titleblock already drawn for you. Many of the architectural background settings such as Units, Limits,Text Styles, Dimension Styles are also already done for you. Basically, it helps you get started FASTER! Now you're talking! All ArchBlocks.com products come with a 100% satisfaction gaurantee!